First off, I´d like to thank everyone who sent me a Christmas card! I received a handful and I really am grateful for all the people who still remember me! Lol, Thanks a lot! Letters are literally the best. This week has been interesting for sure. Well for starters I sure have been learning to love the people I serve. It´s interesting to think about, but my dad told me, and I´ve heard from countless people, that the more you serve someone, the more you grow to love them. I´ve definitely benefited from this promise. Whenever my companion is bugging the heck out of me I tell her to give me her shoes...And then I clean them. I can´t count the number of times I´ve cleaned her shoes, lol It´s really an interesting experiement but it actually works. Even though some of the stuff she does bothers me to pieces I have actually grown to like her! If we don´t work together as companions we can´t teach with the Spirit...and if we can´t teach with the Spirit we´re not going to get anywhere with the investigators in the lessons because the Spirit is the person who´s actually doing the teaching. Funny Story: My companion and I were walking down this dirt path and we saw this dog who was drinking black greasy water out of a sewer. I saw him and I felt really bad for him! I had my water bottle and I looked around for a plastic bag or some piece of trash I could pour was water into, but I couldnt find anything. I then decided that it didn´t matter and I started pouring the water out of my bottle into a little waterfall, feeling hopeful that he´d take the opportunity to drink some clean water...but he just gave me a look like ¨who the heck is this girl and what the heck is she doing?¨ He then started to back away slowly lol Ugh! haha! I just wanted to help him but he just gave me a look like ¨dejeme a tomar agua sucia¨ haha! This week has been interesting for sure! A young couple here that we`re teaching asked me why I gave all my money to come to Mexico when usually it`s the otherway around and the people here want to leave to the states! It was really a humbling experience and I had an opportunity to share the real reason I`m here! They also asked me how I was before the mission and if I always walk around in a skirt and blouse. lol! haha! They told me there`re suprised I`m not spring breakin` it up in Miami or something in my bikini and volleyball in hand! What a riot lol It was definitely a fun lesson. A few days ago I learned how to make legit flan! It is delicious, I`ll have to make it for all of you when I come home! Yesterday I had my first experience of running for my life here in Mexico lol I don`t know if I`m joking or not ...last night we were contacting people in the street and we all heard a glass bottle break....everyone started booking it out of the area! We ran up that hill pretty fast let me tell you! lol #drunkmexicanfights My companion and I were fine, but we`re definitely trying to be careful. I really am trying to be a good missionary but sometimes it`s hard... I`m obedient, but having the desire to be obedient is definitely different. But I`m working on it! Before the mission I never prayed for patience (I did once and I had a horrible day so I figured it was better without this plea in my pray lol ) but here I`m praying for patience everyday! Patience with myself and with others. I`m definitely changing a lot here in Mexico, I hope it`s for the better. If anything I`m becoming more meek and humble. I guess it`s a good thing, but my perspective on life is changing! I definitely living to serve others and the last person on my list of people to care for is myself. It`s definitely a different way to look at the world. Oh and yesterday one of our investigators chewed me out! Ugh it was really a horrible experience but I had good intentions I promise...ok this is the story...she works on a corner selling esquites (corn on the cob with chili and mayo) and she offered two to my companion and I . We took them happily. Then one of our less active members of the ward came up to talk to us and she hadnt been out of the house for basically a week so we were really happy to see her! The thing is that she had a miscarriage and the doctor did a bad job operating on her so she`s been super sick. One this night she told us that she hadnt eating for 2 days because she didnt have money to buy food and she couldn`t eat anything really heavy...so before we went our separate ways, I gave her my corn thing and the lady got super offended and yesterday (2 weeks after the fact) she chewed me out! I didn`t know the lady had seen me or that she`s been harboring these feelings for so long! Ugh! #frustration! I apoligized and we`re going to visit her again this week...so we`ll see how it goes lol. Also it´s pretty interesting, but a lot of people like to wear sweaters when it´s super hot to protect their skin from the sun. I would have never thought of doing that; it´s so different! Also we celebrated Los Reyes Magos on January 5th, which I´ve never heard of before so I think it´s just hear in Mexico. Anyways, it´s like a second visit from Santa Claus for the kids and we eat rosca! Which is this circular piece of bread with little plastic babies inside....(lol) and if your piece has a baby or more than one baby, you need to make tamales for all the other people. haha! It was pretty fun! Hope you´re all doing great! This is how I spent Christmas day! haha! A few of the girls from my district! They´re awesome! Yesterday I had sort of a weird experience...my companion and I were returning to our house and we ran into one of the less active members of our ward here. I didn´t know who she was, but I guessed by the way my companion (who´s been in this area for 5 months) greeted her. We were talking for awhile and I was drinking my water bottle because it was pretty hot, but I had a feeling I needed to give her my bottle of water...what? haha! It was a little more than half full and I was thirsty and didn´t think too much about it so I drank a little more...but I kept feeling like I actually needed to give her my bottle of water! (which at this point was only half full). Right before we parted ways I awkwardly asked her if she needed water for her family and I held out my bottle of water for her. It turns out that she actually took it! I´m glad I could give her the water even though it wasn´t much and even though I didn´t know who she was. I wish I could have actually given her more! This morning I bought an exercise mat to motivate me to actually exercise. I´ve never drank so much coke ( I never drank coke before the mission) and I´ve never eaten so many tortillas! We eat tortillas with everything...and they aren´t the healthy kind either! (If there is a healthy kind of tortilla). I told my companion I wanted to start a work out program called ¨Fight the Fat¨ for the missionaries here in the mission but I don´t think she understood because it doesn´t really translate very well into Spanish. Hey everyone! I usually write on Monday´s but we were without internet here for a few days, but everything's okay, promise ( love you mom!). Christmas was great this year. The 24th is when everyone in Mexico celebrates and the 25th is just a normal day. The 24th (Noche Buena) is when families have their big Christmas dinner and a lady in our ward invited us over! The food here is super spicy and super delicious. On the 25th, when we woke up my companions noticed that Santa had actually found our small little town here in Mexico! With some help from Hermana Ward of course. Now, I`m actually pretty proud of this accomplishment because anyone that´s served a mission knows that it´s almost impossible to do anything without your companion present. We´re always together, but I managed to distract them for a few minutes here and there. Anyways, I made french toast on Christmas morning and everything was great. Later we went to our neighbor Jesus´s house and we skyped with our famlies! I told my mom that I was going to name my first born son Jesus in memory of our kind neighbor...and my first born girl Maria Guadelupe because the people here love the Virgin Mary. I met the new family dog Chopsticks (what kind of name is that....if I would have been present that would not have happened..he would have had a classy name...((love you Nani)) ) anyways, I´m super excited to meet him in 2015. My companion from the MTC Hermana Garcia left our trio to go train 2 American girls! ( We`re only 7 weeks into our 12 week training too so it´s sort of a big deal!) 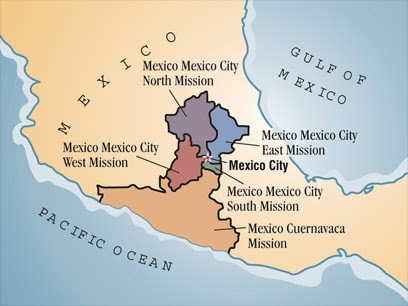 Our mission president told us that we (Garcia, Junca, Young and myself) are the first group of American girls serving in this area of Mexico! Whoa. A boatload of American girls are coming to Mexico in the new few transfers though and the President wants us to be prepared to train in the future...( I really am not looking forward to this, but whatever happens happens lol) So for the time being I´m with Hermana Obregon and she´s a native. Our planned baptism for Selena didn´t happen, but with more time hopefully she`ll make the decision. 1. The toliets don´t flush. Most people have a huge barrel of water with a mini bucket inside and you fill up the water with the mini bucket and pour it down the toilet really fast and bam- it flushes. 2. It´s super dusty. Everynight when we return home we´re covered head to toe in dust. I only ever used my inhaler during the swim season but now I´m taking puffs off it all the time! 3. My companions tell me that I speak fluent Spanish in my sleep...great. Now I just have to transfer this into a being awake thing that I can actually control.